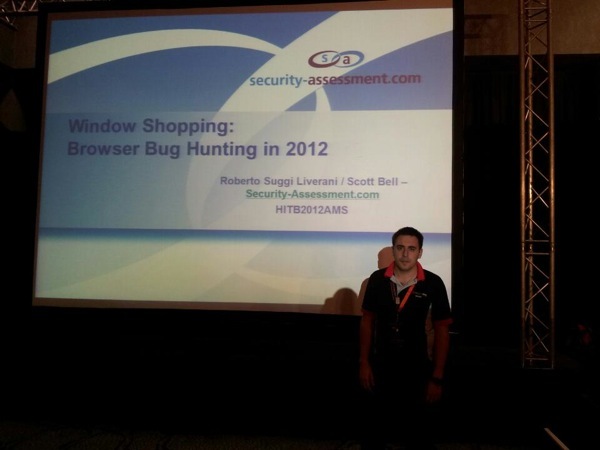 In the last talk of Day 1, Roberto Suggi Liverani and Scott Bell (not present during the presentation), security consultants at Security-Assessment.com, will share the results of some intensive browser bug hunting research, and will drop 5 0days. Roberto starts by apologizing about the fact that Scott was not able to join him at the conference. Everybody uses browsers, Roberto states. Browsers have become predominant desktop applications and we see a clear shift towards client-side applications and attacks. It makes a lot of sense to take a look at the security of browsers. Firefox Use After Free < 11 (Fixed in FF11), found by Scott Bell. 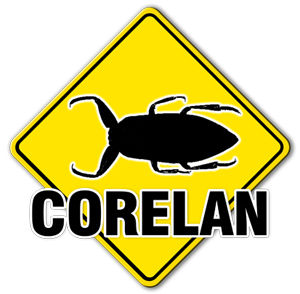 This bug only works in Windows 7. Roberto mentions that it took the devs a long time to get fixed, indicating possible complexity involved with this bug. A slightly modified version of cross_Fuzz was used to find this bug. To make cross_fuzz produce the crash, they basically added more entropy, randomizing call parameter count, removed google_gc() and changed some other things. To create a different HTML file every time, they implemented HTMLGen. They also removed some phases in cross_fuzz to make things faster. After triggering the crash, they had to simplify the html page that caused the crash and remove unnecessary components. Using the JSLOG Firefox extension, they logged DOM operations, allowing them to observe browser behavior around the time of the crash. FInally, they had to trace the browser behavior in a debugger… which took a fair bit of time (months). 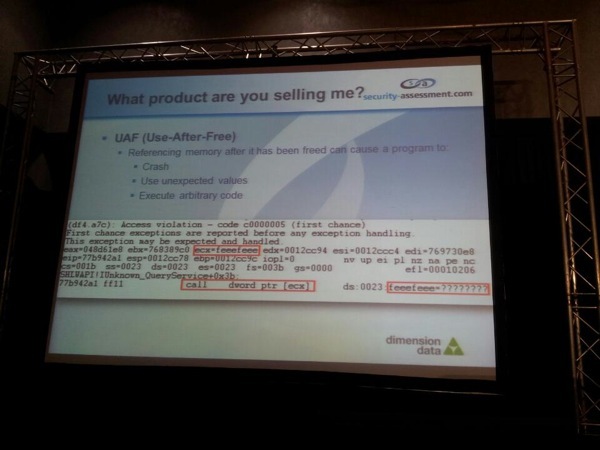 In the end, they were able to pinpoint the exact code that causes the UAF condition. In terms of exploitability, they discovered that there’s some kind of race condition involved, making timings particularly important to gain code execution. The proof of concept code demonstrated on stage doesn’t include DEP/ASLR bypass either (it just sprays and ends up jumping into the spray). Yet another Chinese browser fell apart during their research. Roberto drops 3 0day bugs during the talk (because the Avant devs didn’t respond to any of his reports). Avant is a custom web browser application, using IE (light version) or IE/FF/Chrome (Ultimate) in the background. With 26 million downloads, the app seems to be used by a lot of people. Some of the files in the res folder are rendered in special pages, allowing for the execution of a privileged function (ARFunCommand()). They fuzzed the methods from this undocumented function and found some interesting results, returning information from the browser and browsing sessions. Using the 60003 value found during the fuzzing, they managed to perform a SOP bypass and XCS. Labeled as low severity by Opera, because Roberto couldn’t give them a proof of concept exploit. (???) It was recognized as a memory corruption bug, but not classified as a security issue. At the same time, Opera mentioned that, if Roberto would deliver an exploit, they might revisit their position. The researchers used their own custom fuzzer to find this bug. Some browser vendors still do not understand how reporting & dealing with security disclosure works. Presenting browsers to be “as secure as IE / Chrome” provides a false sense of security. This concludes my first day at Hack In The Box 2012 Amsterdam. Stay tuned for more posts tomorrow!